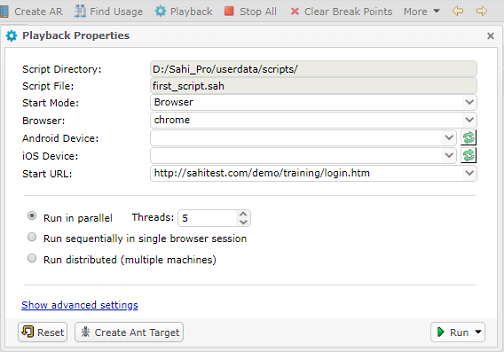 abstract This is a quick tutorial to get started with Sahi Pro Browser Automation. 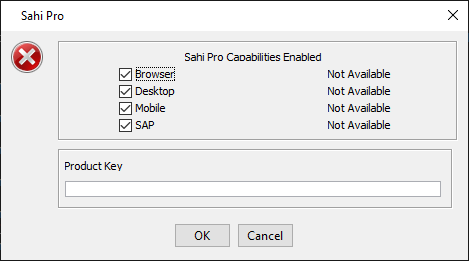 warningRead this page to get familiar with Sahi Pro before trying the Sahi Pro Desktop Add-on. Java 1.6 or above is needed for running Sahi Pro. Download Sahi Pro from Sahi's download archives. You will need a valid license to run Sahi Pro. If you do not have a valid license yet, you can register here for a 30 day evaluation license. If you wish to upgrade from an older version of Sahi, please refer to Upgrade for details. Double click on install_sahi_pro_xxx.jar to start the installer. If Java is configured properly, it will launch the installer. Start from the command line. warning Sahi looks for browsers in their default install location, and if found, displays it on the Dashboard. If you do not see your browsers, configure your browser paths correctly. If you have never added your Product Key, you will be presented with Sahi product key popup window. Enter the Product Key and click 'OK'. Copy the Product Key into userdata\config\productkey.txt (create the file if needed). If the Product Key is valid for selected product, Sahi Pro will start normally. To launch controller click on "Sahi Controller" link. Controller can also be launched by ALT and double click on the browser window. info If that does not work, press CTRL and ALT keys together and then double click. Make sure popup blockers are turned off. On the Controller, go the the Record tab (would be selected by default). 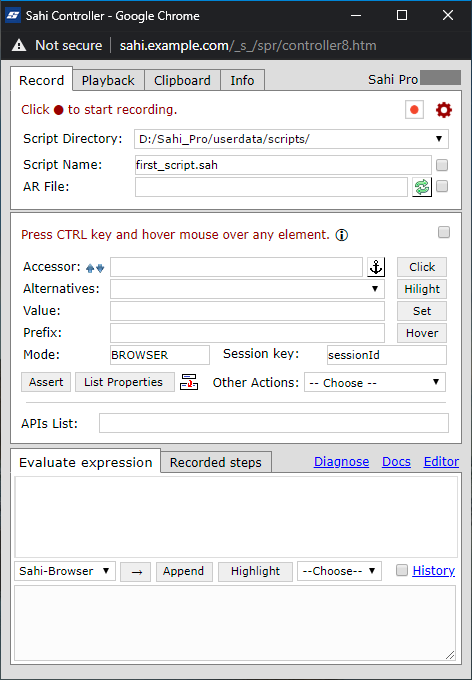 Give first_script.sah as the name for the script, and click 'Record'. Click on the "Sample Application" link on Sahi's start page. This will bring up Sahi's sample application. Enter username 'test' and password 'secret' and click 'Login'. 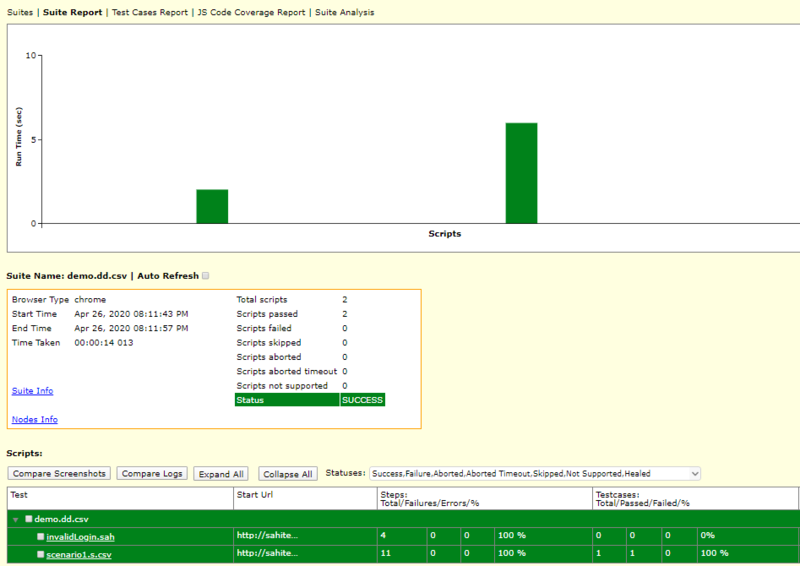 The last recorded step will be visible in the 'Evaluate Expression' box. 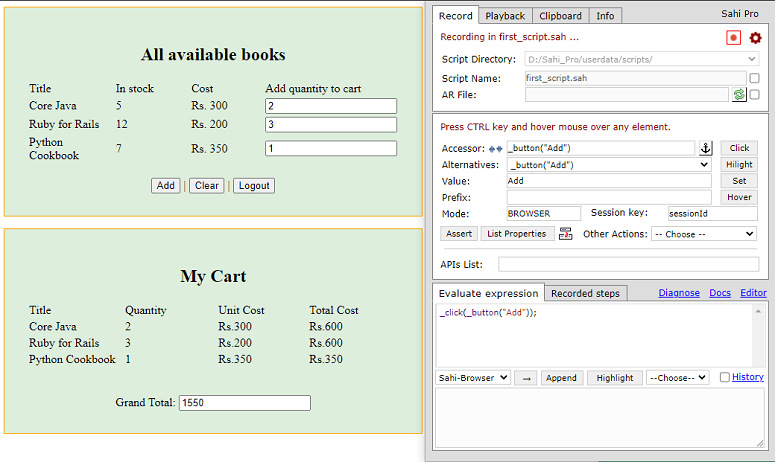 On the next page, which shows a shopping cart, add quantities 2,3,1 and click 'Add'. This will display the added items at the bottom and its total. Move the mouse over any html element while pressing CTRL key. warningOn Mac, the application window needs to be in focus to receive mouse events. First bring the application window into focus by clicking on the title bar, or by using Command-Tab. Click the "Assert" button to generate assertions for the element. They will appear in the "Evaluate expression" box. Click → to check that the assertions are true. Once satisfied, click on "Append". This will add the assertions to the script. Click 'Logout' to logout of the application. Click 'Stop' on the Controller to finish recording. info Note that the Controller can be closed and reopened at any time, without disrupting recording. 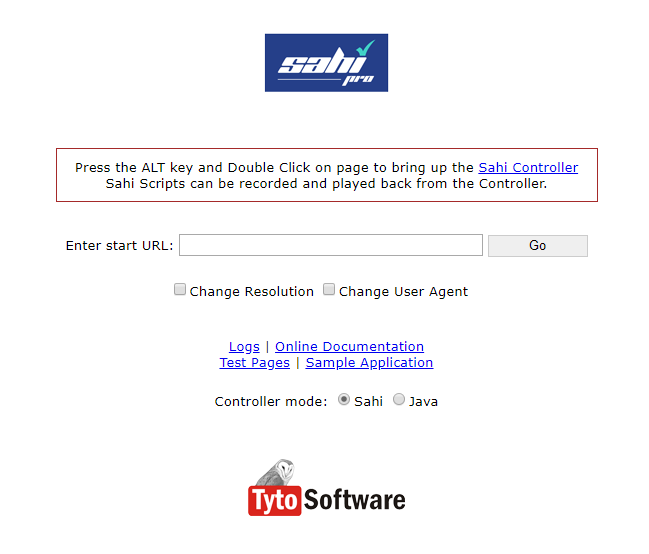 If not already open, open the Sahi Controller (ALT-DblClick on the page). 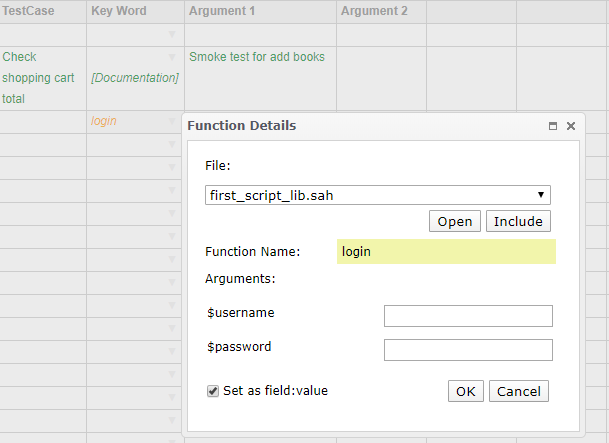 Enter the script name for example: first_script.sah in the 'File:' field (with the help of the autocompletion feature). Enter the Start URL as 'http://sahitest.com/demo/training/login.htm'. For your own scripts, if you had started recording from http://www.google.co.in, use that URL. Steps will start executing, and the Controller will be updated accordingly. Once finished, SUCCESS or FAILURE will be displayed at the end of the steps. Note that the Controller can be closed at any time, without disrupting playback. Recorded scripts need to be refactored into functions for better readability and maintenance. To accomplish this, we need to create well named functions from our recorded steps. 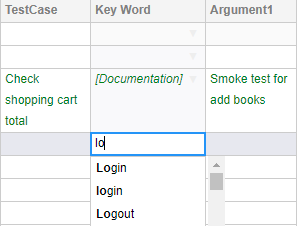 Select the statements pertinent to login. Give a name to the function, in this case 'login'. Click on Continue. This will create a function, and then call it with the correct parameters. Below code explains to create a function using pass by object. info Since Sahi Pro 8.0.0, default variable $arguments inside function is introduced which returns object of function parameter as key and argument as value. Run this script. Click on "Playback" button on Editor. Select browser and enter start URL. Click on "Run" button. View the logs. The logs now look nicely folded down at the function level. Clicking on 'login' will just open up the steps that were performed under login. This helps in easy understanding of logs and helps isolate problems easily. 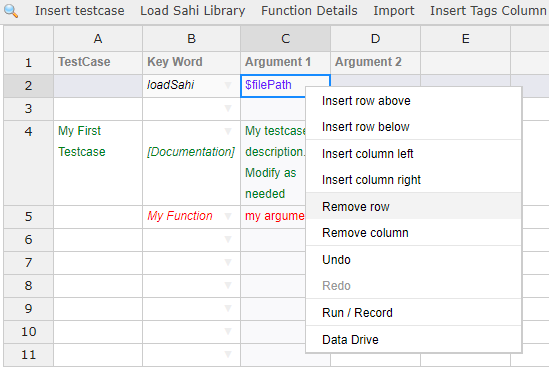 The Sahi Framework allows testers to write their testcases in Spreadsheet Format(Excel like) and run it from Sahi. Often a testing team consists of a mix of subject matter experts, some manual testers and testers with some automation experience. Writing tests in the language of the business allows all stake holders to participate and derive value out of the automation process. To create a new scenario file, hover over the arrow adjacent to the 'New' button and select the 'Scenario' option. Right click on cell, and select "Remove Row" from the context menu, for the rows with data in red color. Start typing the name of function. In this case our function name is "login", so on typing initial letters, for example: "lo", Sahi Editor's autocomplete gives a list of possible options. Select the function from the dropdown. Now do Ctrl+click on "login" cell. 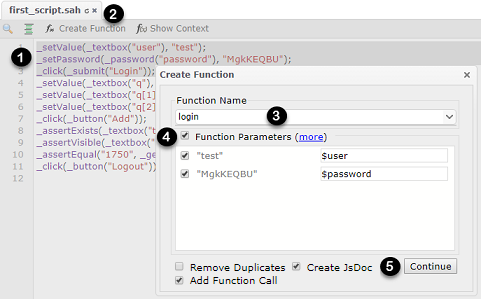 "Function Detail" popup-window gives details of the selected function and its arguments. Click on "Include". 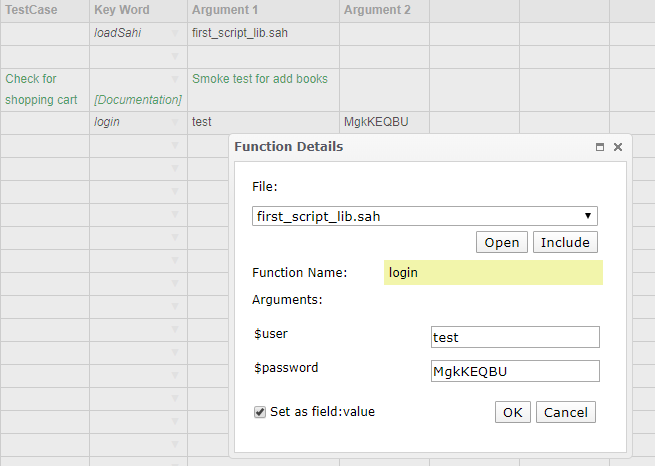 This is make "first_script_lib.sah" file available to the scenario file. If other library files contains function with same name, select the required library file. Executing the Scenario sheet is no different from executing a Sahi script. Click on "Playback" button on the Sahi Editor, and then click on "Run" button. On execution, Sahi generates logs showing success or failure. 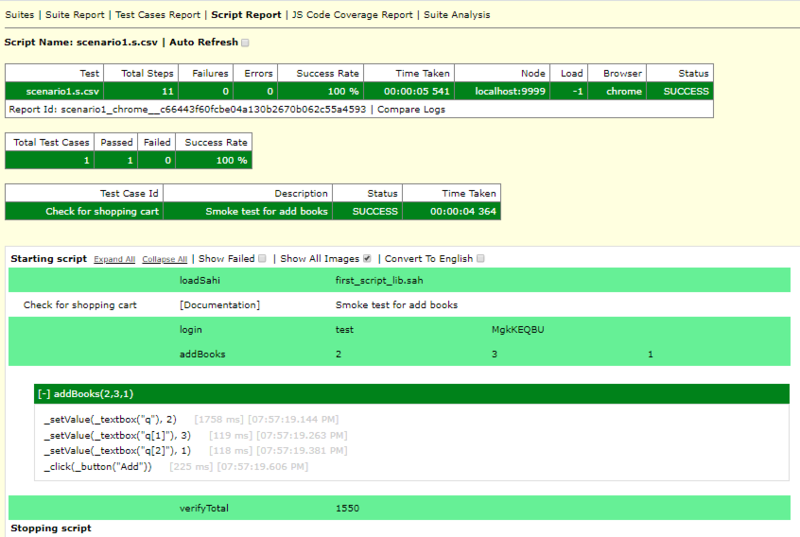 Logs are visible from the "Logs" link in Editor. 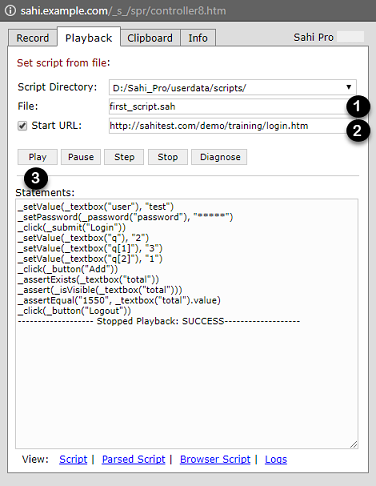 Please refer to sahi/userdata/scripts/demo/framework folder for some examples. 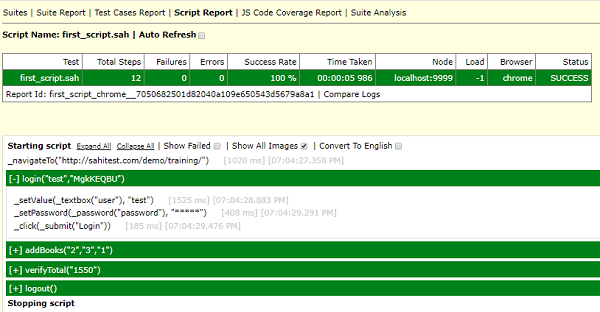 To playback multiple scripts in batch mode, we need to first create a data driven suite file. 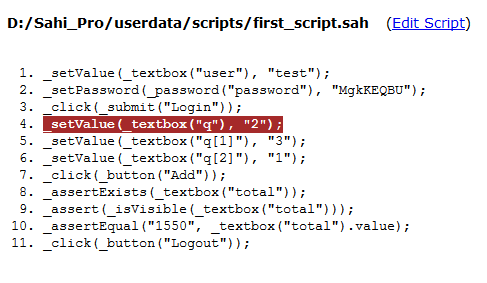 Create another script file invalid_login.sah with the following contents. To create a new data driven suite file, hover over the dropdown adjacent to the 'Create Suite' button in Editor and select the 'Data Driven Suite' option. 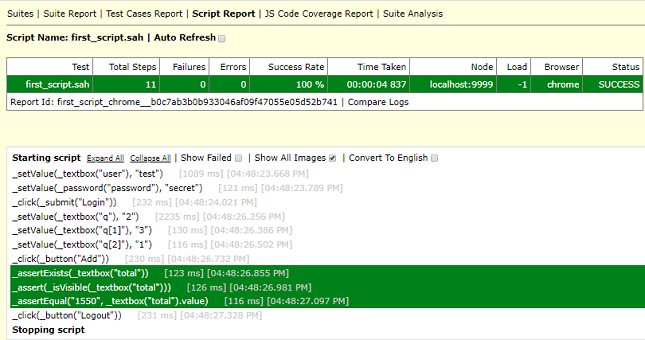 To execute the suite file, click on "Playback" button on the Sahi Editor, and then click on "Run" button. Clicking on any of the script links will take you to the logs of the individual scripts as seen before. Sahi Pro Best Practices - IMPORTANT!